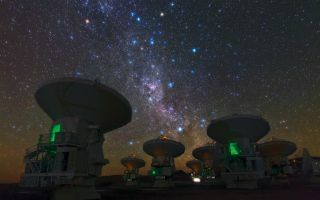 ESO Photo Ambassador Babak Tafreshi snapped this remarkable image of the antennas of the Atacama Large Millimeter/submillimeter Array (ALMA), set against the splendour of the Milky Way in this space wallpaper. This view shows the constellations of Carina (The Keel) and Vela (The Sails). The bright orange star in the upper left is Suhail in Vela, while the similarly orange star in the upper middle is Avior, in Carina. Of the three bright blue stars that form an “L” near these stars, the left two belong to Vela, and the right one to Carina.